ACROSS the globe, there are 2.6 billion social media users who connect to digital communities and companies through their platforms of choice. Reaching these people depends on your ability to keep up with the trends in a changing industry. Knowing whats current — and what isn’t— will help keep your business relevant, and your social media strategy worthwhile! Did you know that Americans spend 80% of their social media time on mobile devices? To succeed at growing your community, you need to share content that translates to smartphones and tablets. Incorporate visual content and short written blurbs into your strategy rather than focusing long-form articles. As more social media platforms gain popularity — and it gets harder to manage them all — automated social media marketing has become indispensable to business owners. Use tools like Buffer or Hootsuite to plan posts in advance and align them with your marketing goals. Automating your social media help increase your efficiency, save you time and not to worry — if you do it correctly, won’t sacrifice your personal touch! You target with traffic, right? Well, honing in with a specialized platform will streamline your strategy in the same way by enhancing your social media presence for users who are really interested in your niche. Have you heard of Food52, Gentlemint, or Learnist? Niche social platforms are viable opportunities to meet and connect with your ideal buyer. Do some research to uncover social networks that align with your industry and focus to see your engagement soar! Twitter, Facebook, Instagram, and Pinterest all recently upgraded their “buy buttons.” For brands, this means that e-commerce strategy needs to embed into a social media plan. Include in-line buy features to your social media accounts to bolster sales. Providing direct, clickable buttons makes it much easier for interested social media users to take you up on your offers. Easy access means more sales, which is an obvious plus! This year, Snapchat rose in prominence, Periscope and Meerkat gained traction, and Instagram lengthened their videos to 60 seconds. Now, Facebook is following suit. To make the most of the video trend, start using Facebook Live. You can share snippets of your day-to-day experiences and highlight your company’s offerings through video streaming on Facebook. Videos give you more time to engage users and generally don’t take much longer than a photo to shoot. Sounds like a win-win, right? A lot of marketers focus on creating viral content, but it’s not as impactful as day-to-day engagement. Instead of focusing on making a one-time impact with a viral Tweet, resonate with your community by offering consistent posts with value and purpose. Have you ever followed someone on Twitter, only to receive a direct message, “Thanks for the follow. Please like me on Facebook and follow me on Instagram”? Don’t take this route. Rather than of forcing one person into more follows, focus on building your community organically by actively engaging with and sharing content from influencers. Public posts take just as long as private, direct messages and reach a much broader audience. Don’t limit your reach — or waste your time! Many social media users embrace platforms as an opportunity to complain, making their mark with sarcasm and negativity. Although this strategy can help people “get seen”, it usually garners bad attention. As a marketer or a business person, always keep your posts upbeat and enjoyable to read. People gravitate to positivity, and while you may get some initial reactions from negative posts, you don’t want to build your brand based on that. Your reputation on social media is established through recognition — don’t build it on negativity! Your social media presence can ultimately make or break your strategy, so be sure you stay in-the-know. 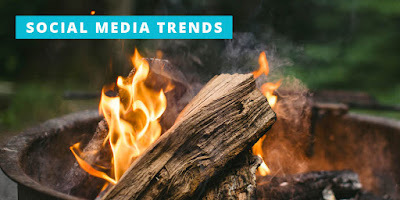 These trends can transform your business, opening your social media channels up to new connections and burgeoning communities. This month, try to incorporate or drop at least one of the ideas into your strategy. Follow this advice, and you’ll set yourself up for more positive interactions with your target audience! Your turn: Which old-news tactic do you need to drop, and what will you be replacing it with? Let us know! Post a comment bellow and share it!